You've just turned 50, and your doctor's told you to take things easy. That slightly elevated blood pressure and your 20 extra pounds are not to be ignored. And then, just when you've decided to be calm no matter what happens, the KESC sends you a bill for Rs. 88,000. You reel and stagger. This must be someone else's bill. But another look confirms your worst fears. But you've always conserved electricity, your bill's never been more than Rs. 4,000 over the past two years. You go back and look at your meter. It isn't running, and has stopped at the reading recorded in the bill. You breathe a bit more easily now, the tight feeling in your chest goes away. What happened is obvious: as your meter approached the end of it's life, it registered a sharp increase. You'll get the matter sorted tomorrow, no problem. The next day you go to the Billing office. The Assistant Controller is at a meeting(someone tells you that he's never present in his office, he's always in a meeting). They tell you there's only one man who can deal with your problem, and he's very busy, surrounded by people whose bills have mistakes in them. You wait another hour before it's your turn. He listens to you, shakes his head, and asks you to pay the bill at once, or your supply will be disconnected. He can't do anything else, there's nothing wrong with the bill, it looks O.K. If it'll make you happy, he'll send someone over to read the meter again. You go out a beaten man. But all is not lost yet. You're an engineer yourself, and you've been a visiting lecturer at the premier engineering college in the country. 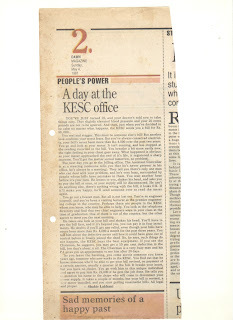 Perhaps there are people in the KESC whom you know, who may be able to help. You look in the telephone directory and find that two chief engineers were in your class at the time of graduation. One of them is out of the country, but the other agrees to meet you the next morning. He takes one look at your bill and shakes his head. You'll have to pay the bill first, and if it's beyond you, you can pay it in four installations. He doubts if you'll get any relief, even though your bills have never been more than Rs. 4,000 a month for past three years. You tell him about the defective meter and how it could have gone out of control before it finally joined the dead. No, he says, such things do not happen, the KESC buys the best equipment. If you see the Chairman, he suggests, you may get a 10 per cent deduction in the bill, but that's about it all. The Chairman is a very busy man and his PA gives you an appointment to see him after 20 days. As you leave the building, you come across someone you knew years ago, someone who now works in the KESC. You find out that he knows someone who'll be able to get your bills revised, on payment of a certain amount, usually a quarter of the bill. It breaks your heart, but you have no choice. You go with him to this unique individual and agree to pay him Rs. 22,000 if he gets the job done. He tells you to mention his name to the chaps who will come to disconnect your power supply. It takes a couple of months, but your bill is revised, a new meter installed, and you start getting reasonable bills. All legal and proper.